This jersey has been personally signed by Penguins sniper, Evgeni Malkin. This jersey has an NHL All-Star patch on the left shoulder. Malkin has had nothing but success since being drafted 2nd overall by the Pittsburgh Penguins in the NHL Entry Draft in 2004. So far, Malkin has played three seasons with more than 100 points and has been a point per game player in all seasons but one. Malkin has been a key player in the Penguin’s three Stanley cup wins earning him the Conn Smythe and Art Ross awards in 2009. Malkin had an outstanding season in 2011-12 earning the Art Ross, Hart Trophy, and Ted Lindsay award all in the same year. During Malkin’s rookie season he scored 85 points earning him the Calder Memorial Trophy. 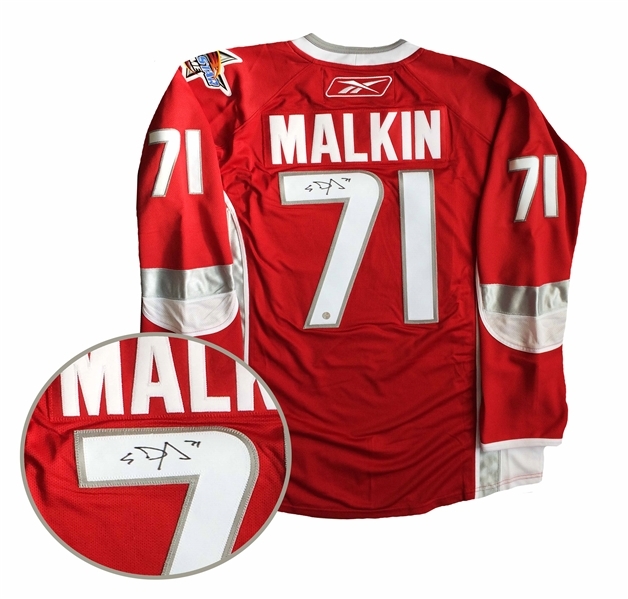 This NHL and NHLPA licensed product comes with a Frameworth COA and hologram to ensure the authenticity of the autograph. We do not guarantee any specific jersey sizes but we typically carry sizes L, XL or 52, 54 & 56 for jerseys. These sizes are considered the most ideal for framing & displaying.